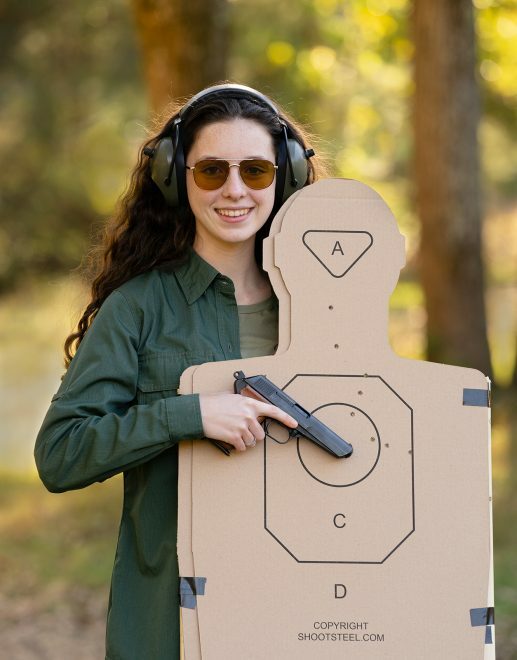 Cardboard targets from the steel specialists. This entry was posted in Uncategorized and tagged AllOutdoor. Bookmark the permalink. She needs to work on her breathing sequence…. Wow! That’s a great 100 yard group for a military surplus pistol having a crummy trigger, fired with one hand, at five rounds per second, standing unsupported in the wind, with a package of firecrackers going off under her feet, immediately after running a hundred yard dash while carrying two five gallon buckets full of water without spilling a drop! Amazing! Stating or showing a group size is irrelevant without accompanying data, such as distance, shooting position, conditions, the load used, and whatever else may have been relevant at the time. Saying “My pistol can shoot two inch groups”, by itself, means absolutely nothing at all. Therefore the proper response to that photo, if you’re thinking along the lines of shooting accuracy, is to ask; at what distance was that group fired, and from what position? Also; is that group representative of an average group for that gun, with that shooter, at that distance, with that ammo, in those conditions and circumstances, or is it something of an outlier? The actual purpose of the photo of course was to show the new target products with someone who had clearly been enjoying herself with them. I hope that one has new rollers and firing pin. Lately I’ve eliminated the target base altogether by wrapping the bottom of 1×2 furring strips with strapping tape and drilling a deep 3/8″ hole in the bottom end. Then using a rock I drive a couple of aluminum stakes for each target that are just under 3/8″ dia. so they stick up about 6″ and pop the 1×2 posts over them. If I lived where the ground was softer I wouldn’t even bother with stakes, I’d just sharpen the posts and drive em in directly. Assuming the ground is soft enough to drive stakes, yet not too soft to support the target, everywhere you may go. I’ve done the above too, which often works, but settled on using a stand which sits atop the surface, which always works; rocks, mud, no matter. There’s a compromise between light weight and having a target that stays up in some wind. Even light ground stakes can sometimes pull up pretty easily. I prefer light weight, unless I need heavy weight. So get the light target stands shown, and keep some bags of lead shot, etc. in your rig for those instances when needed. CZ 52 I have owned two. I sold both because I was offered stupid money for the full holster/spares/belt set. IMO some of the best weapons to come out of Europe are made in the Czech republic.